It was soothing for me to be out there with a group of women trustees and friends who had been out before and notice everything, and who were unquestionably willing to add seemingly superfluous, but nonetheless encouraging, touches. Nan and Leslie put a coat of paint on the watch gallery walls—they’d both already worked hard on the ceiling. The day had to be short because of the tide, but they had time to use up the last of the paint on the brick around the windows in the stairwell before we left. Meg and I had spent a good deal of it scraping and sweeping the stairwell walls, so to have that touch up, that glimpse of how it will look when it all painted, was blessed. I’m so glad I took pictures. Steve came out for about a half-hour, while the launch waited, to check out the back wall in the kitchen. He hadn’t been there since 2010. A lighthouse surrounded by water is like a ship, and he has all that expertise. I’m sure if he had $1 million he’d send out a crew to knock out things like the stairwell and the cellar. But he doesn’t, and he respects and understands the scope of the Crew. I’m glad we keep the place tight and tidy in case “someone important” comes along. We went out in a lovely fog that burned off, but the walls were still damp when we left. It will be good to seal the opening in the kitchen wall; Steve will help. The big rock was emerging from the beach, or we would have stayed longer. For some reason I tossed my lifejacket down to the deck of the Nicholas, and missed, and it landed in the drink. Not cool. Fortunately Rob retrieved it, or Teresa would have killed me. Lighthouse Log Book is a series of stream of consciousness writings by Executive Director Erin Urban after each Crew date at Robbins Reef. It’s informal and meant to impart a sense of the energy of the volunteers and the work they accomplish in regular seven-hour workdays to Robbins Reef Lighthouse. I stayed pretty clean this trip out, doing the usual sweeping but mostly shoring up and pitching in where needed. Everyone out there knew what they had come for. David, so quiet and smart, did what needed to be done to finish the equipment room. That meant knowing where everything is and putting it all back in place at the end of the day. Nan also. No fuss—just “Okay,” and she went up to the watch gallery to put a last coat of paint on the ceiling. I started the day being steaming mad at Cooper for making everyone wait at the ferry for him. Not the first time he missed it. Nonetheless he too knows what needs to be done, and he got the four stationary windows in. We talked about caulking the insides, but left it to Eileen, who is expert at it. They’ll be okay for a week or so. As they are, they’ll set. I hate to think after all we struggled to strip the wood surrounds, we’ll have to paint them white. But there are splits in the wood that need to be closed with caulk. Maybe we can stain them or use brown caulk, and then sand and varnish them. How great it was to see a round window (I did this twice) and think the glass wasn’t in yet—but no! It was—and so clear and clean. Three things loom: The hole in the kitchen wall where the Coast Guard chopped out the alcove to make a door, the stairwell, and the light gallery. Covering the exterior of the hole with steel and a gasket seems relatively easy. I’m not sure. But rebuilding the alcove requires brickwork. That means bringing a half-pallet of bricks out—er, I mean, asking Glen to do that—and unloading it. We could do it too, though, little by little. Then I have to find a bricklayer. Cooper says he thinks it will need a double course of bricks to make it to the depth of Kate’s alcove. Meg is sad that we will have to paint the bricks white—but we do. Personally I am worried about the damn threshold. So how did I stay clean today. Well, I wiped down all the condensation on the windows and opened them a bit to let air in. I stuck plastic into the kitchen “door” cover after Meg pointed out how open it was around the edges—ran out of duct tape—used painter’s tape—to hold it in. Also helped everyone. Found things, organized things, cleaned up, took a lot of photos of the hole and the cover. The stairwell is becoming more and more reasonable each time I look at it. I thought at first we would never be able to do it but now, thanks to John Tretout, I know we can brush it down, scrape as needed, and seal it. I am going to keep hoping the Coast Guard has a carpenter who can replace the rotten beadboard in the light gallery. It has to be taken out along with the little round screens, which have to be cleaned up, and replaced. And we have to make sure the windows are tight. I’ll appeal to the captain and crew of the Katherine Walker again. Miscommunication at Miller’s left people ready to leave, but it took an hour before anyone showed up. Teresa wasn't in. She always tells me what’s up. So while we waited Nan and I organized the bedroom supplies, sorted gloves, and she decided she would recover the seat on the little wooden rocker we’d brought out last spring. She’s always imagining what the place will one day look like one day. When Meg said she was having a messy day, I wish I had taken heed. I was too, but I didn’t realize it fully yet. Last night when I was falling asleep I was thinking I could conceivably spend a night out there. Now, after a crew day, showered, I still have that restoration dust in me. But I could stay out on the balcony where the wind would blow a lot of things out of me. So yeah I made a hot mess. When I got back to Miller’s I heard a customer say, rather rudely I thought, “…arm’s covered in paint…” Okay, I won’t paint out there anymore. I cleaned up the floor and ladder, and took to the hatch covers on the Watch Gallery and the ladders, which are rusty. I want to see how the sealer will work, and then paint them after we finish the rooms. Be good to get the stairwell done so we can pull up the ramboard. Cleaned up, generator and the shop vac, lots of garbage, high tide, and Tony to pick us up. And though we have made many faulty comments, one I will stop making is “It’s always cool at the lighthouse.” Today was brutal because of the humidity, and we felt like limp dishcloths—or should I say hot messes—at the end of the day. In fact we split a half hour early. I love Kevin Mahoney; there’s never a Crew date that goes by when he doesn’t lend his calm spirit to the endeavor and to me. On the way back from Miller’s in his van, he said he could not wait to see the photographs and ideas we get when we visit Tarrytown Light, and he is so right. Our place is starting to emerge from years of weathering. It’s beginning to look a lot better out there. I hesitate to say it, but we could be on the home stretch on the interior. I can see the rooms emerging in the light and air that fills the fourth floor when you are up there and the stationary round windows are out--we’ve been taking them out to try to get the paint off the glass. With fresh air blowing in, you can understand why the lighthouse was such a remarkable place in which to live and grow up. My mother used to call my sisters and me to her kitchen window, “Girls! Come look at the sunset!” And we would. So it might have been that Kate called Jacob and Mae to a window to see a storm coming up over the Narrows, lightning on the Jersey side, or a sunset over the Kill Van Kull. Much to my delight Cooper took on hanging the doors. He sorted out hinges and hung a closet door in the sitting room and the six kitchen cabinet doors. We were on the same wavelength because, frustrated by the time spent on getting paint off the round windows, I stopped and used the water, Ivory detergent, and ammonia I’d tried on them on the linoleum that covers the cabinet shelves. Lots of scrubbing with steel wool and even a scraper and a razor blade, and they became a lot cleaner. Nice to know the doors are protecting a clean and painted space. I’m stopping there. I’m not taking off the linoleum or the metal brackets that hold it in. It will do for now. It’s clean, and the doors are beautiful. Can’t wait for the fasteners. As always Meg was by my side, right-hand woman, trying to get the paint off the windows, (who the hell painted the outside glass and why? ), polying some window sills again, grinning when I asked her to throw another coat of poly on "my” stepladder, and finishing up some painting, doing a quick sweep of the first cascade of stairs, and closing up at the end of the day. I guess the reasons I sweep, wash, and clean out there are many. It is emerging. That hit me today when Coop started hanging the doors we’d slaved over. The white room, the painted closet, and now an oak door. Another reason is the need to make it a space we can work in—“a place for everything and everything in its place” so what we need can be at hand and there’s no debris around. And I know, but this is an s o c, that our lighthouse is responding to our care. I remember driving by Building D after a volunteer had power washed the granite façade. It gleamed. Glancing out from time to time from the kitchen windows to the seed-filled grasses growing through the foundation cracks, I thought about Kate. Did she grow herbs and flowers out there? Was she a gardener? What to do in 45 minutes? Tony said he would come and get us between 11:30 and noon. I know my fellow crewmembers will hoot, but I sanded the wooden stepladder I’d found when one was needed—on the way home from a trip out. I think it’s quite lovely and I want to varnish it someday. Tony took us out on the Julia—that’s always good. He realizes Meg has a bit of trouble on the trips out and back, and we even talked about motion sickness; he gets it if he reads while on a bus or a train. The tide was very low—down to the sixth rung on the lower ladder—and he had to pull in next to it, rather than at the foot of it. “Can you do it?” he asked, as I looked at the bottom rung. “Yeah,” I said. I always look only at where my foot has to go on the ladder. Everybody was able to get up and on to Jeff’s platform. “You got the key?” Tony called. “Yeah,” I was happy to shout again. “Thank you!” I watched him pull out of the cove, turn, and pull away. We got a lot done, though some plans and ideas did not turn out as I’d hoped. I thought we could end up varnishing the surrounds on the entry doors to the rooms, but the work is too formidable. I also hoped we could clear the glass in the round windows if we got them out—they were painted green on the outside. Coop got them out, but the glass is very pitted after being there for about 140 years, and we could not get the paint off. I took them out to the plinth and put Peel Away on them—figured it would work in a couple of hours but it didn’t. So we have to either put Peel Away on them and leave them overnight or find another solvent that will dissolve paint on glass. Even steel wool and razor blades were ineffective. Eileen and Nan finished the caulking and putting a second coat of paint in Mae’s room. Coop got a round window in Jacob’s room out and what a blast of air! The higher you go in the tower the breezier it gets, another possible explanation for why some windows were not made to be opened. Then he went to Mae’s room and got two more out. It was my idea to put Peel Away on the glass. I figured it would set in a couple of hours under plastic, and then it would be a cinch to get the paint off the glass. But no—the surfaces were too pitted, plus we need to make sure we are ok using Peel Away. Even with scrapers, razor blades, and steel wool we could not clear the glass. Nan’s such a joy and went around using up the last half inch of paint in her pail. We swept up and shop vacced. Coop and Meg had been messing around seeing how much we have to do in the stairwell; we can sweep a lot of the peeling and chipped paint off. Eileen finished painting Mae’s closet. Coop messed around with little things, and we examined, measured, and photographed the hinges on the kitchen door. They are big and quite handsome but they probably will have to be replaced; one of them is cracked. Coop wants to take care of that door now to give a very nice “finished” look to everything we’ve done so far. It needs a piece of glass for one of the windows in it. I was outside scraping paint off a round window when a voice came from the ladder. I sounded the call for retreat. We all did the vaccing and clean up—lugged another plywood and sheet metal window cover to the Anthony, captained by Ray, and got out of there with garbage, our packs, rags, brushes, and inventory of what we will next need out there. Lots of things to think about; lots of priorities to order. Ray’s a careful captain and we sped back safely—Coop, Eileen, Nan, Annie and Meg outside in the wind. This whole adventure is powered by Glen Miller and his staff. They are amazing. I’ve always felt that the room above Kate’s bedroom was her daughter Mae’s room. I wondered where her bed had been—against what rounded wall it stood. No doubt it was decorated as beautifully as the rest of the house-- “bright white,” with a carpet, a dresser, a chair, perhaps a table, and places for her books and porcelain dolls. I also began to think that the other room on that floor belonged to Kate’s son Jacob. One of its round windows overlooks the Manhattan skyline. There’s a pretty landing outside the two rooms; the ladder to the watch gallery curves up from it, and there’s a round window—one of four that opens, in the wall. Kate said she would stand at that window and look out to the cemetery where John was buried. It still has its turnbuckles, glass, and rim, and we’ve always been able to open it. Kate climbed up to this landing, to the ladder leading up to the watch gallery. That gallery is lit from above by eight glass windows in the ceiling between it and the top deck, where the light is. Some of that light filtered down to the floors below. While her children slept Kate made her way up from her bedroom, or perhaps the kitchen or sitting room, where she kept her log books, through the metal stairwell with its brick, cast iron, and beadboard walls, to the light deck to fuel the lamps with kerosene. I wonder if Mae heard her from time to time. No doubt she did. So today, and I know it’s speculative, I got another clue. While scraping and sanding the small closet in Mae’s room—I’d done it before but not well—I realized that a peculiarly cut piece of wood up in the room was a shelf for that closet. Then Coop looked in and noticed that about three feet off the floor, on each side of the closet, was a wooden shelf bracket into which a pole would have fit—a bar on which to hang clothes. Oh this is all ridiculous—the timeline is way out of line—but the height seems right for it to be the place where a little girl might hang her dresses. “Ahhh,” said Megan, when I showed it to her. There were other slabs of wood set into the closet walls, but, well, this is an interpretation we shared. Later she spoke ruefully about how frustrating it is not to have any images or even records of the days in the eighteen-eighties and nineties at the lighthouse. But we do have our instincts—our speculations--our accumulated days of work bringing Mae’s home back to life. 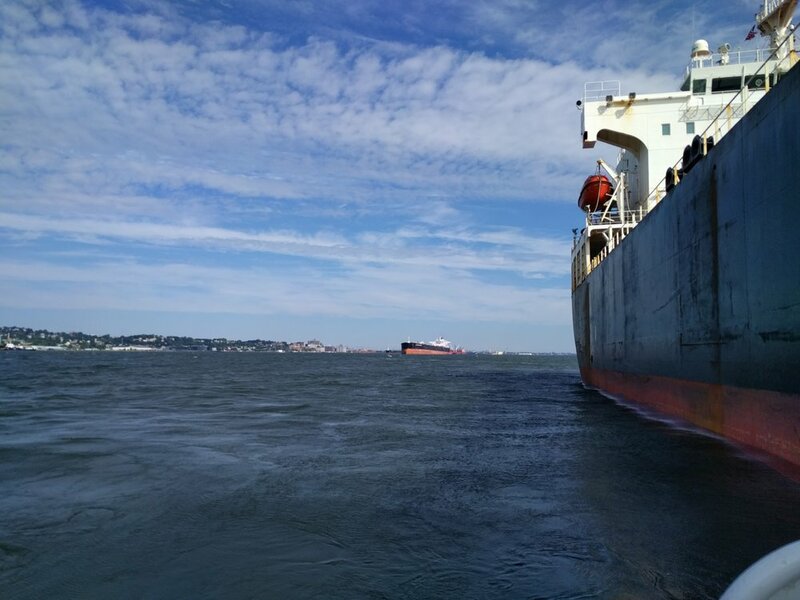 Rob took us out on the Nicholas with stops along the way to drop off one tech near Fort Wadsworth and pick up another near the Verrazano Narrows from massive freighters anchored in the Harbor. 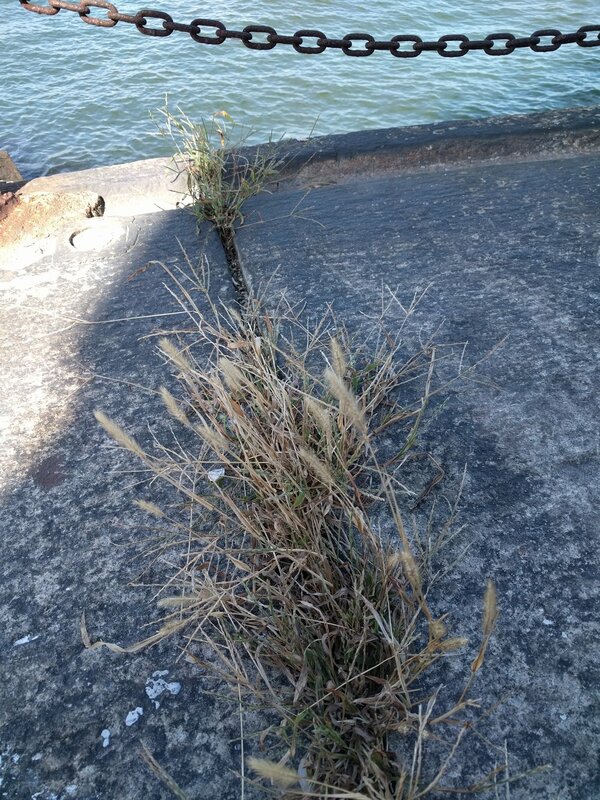 I tell you, the Staten Island shoreline looks mighty nice from the water. It just may revert back to the 1800s when the Island was a weekend and summer retreat for wealthy Manhattanites. Coop painted the ceiling window surrounds that Robb had prepped the prior week and they look so great. Jeez, why do I never have my camera when I need it? Eileen continued painting the fourth floor landing. First she caulked all the holes and rough places on the beadboard, as Laura had suggested we do after we put on the first coat of paint. The caulk dries quickly, and by the time she had worked her way around the room and across the beadboard ceiling, the caulk had dried where she had started and she could paint. By lunchtime she’d covered the ceiling and the top half of the walls with a second coat of that bright white paint. She’s quick and clean. Coop got front and back coats on the doors—two kitchen cabinet doors, an entry door, and a closet door. The day was so sunny and breezy, and the wood so thirsty after all that Peel Away and sanding, that the finish dried quickly. We broke for lunch on the plinth again—it’s cool down there and with the lighthouse at our backs, we were shielded from the wind. Bing cherries, Eileen’s edamame, and Coop stretching, turning, sliding, lifting in his forms on the promenade against the Bayonne line. Grimly I went in and faced what I’d said I’d do—I do what I say I’ll do, short of murder. So I cleaned up, moved a door or two, and poured bleach through my yellow funnel from home into a spray bottle. What else did I need? Oh yes, Ciro’s mold retardant in another spray bottle, and rags, a broom and dustpan, a pail for garbage, a pail for dirty rags, a couple of jugs of water and a bucket. And for me a tyvek suit and helmet, goggles, plastic gloves—not the heavy ones. I’d covered the Coast Guard, NOAA, and Wheel equipment with Coop’s Daily News and taped it down before lunch. Suited like a rocket man, I entered the equipment room, removed stuff like the Loveable Loo, and then started spraying bleach and wiping it down, moving across the walls and ceiling, hitting the black dirt and mold. The goggles fogged up in the stuffy room, but it looked better around the bad spots, though it took a couple of passes with bleach. At more than one point I took the goggles and helmet off and stuck my whole head out the round window on the landing. Ah, those lighthouse breezes are the best. After Eileen’s critical acclaim I hit the surfaces again and let the bleach sit for awhile while I asked Michele to start getting ready to sweep and shop vac. Coop had already moved the generator out. Then I sprayed mold retardant in the equipment room, even on the floor, and left. Ugh--but what a relief to strip off that tyvek. We cleaned up and watched the Erin Miller speed out to get us. Getting a splash of Bay water as it skimmed the waves and rushed back to home was almost as good as a shower. We met at the museum—Kevin took Sam, Dean, Annie, and me in his van, and we picked up Coop at Boro Hall and unloaded at Miller’s. I had the pleasure of giving Terry and Teresa our new Robbins Reef t-shirts—they loved them. Tony took us out on the Nicholas; and we slid into the cove as was the tide was coming in—six rungs on the lower ladder. We had gone over things while waiting at Miller’s, and everyone knew what to do. Generator out, saw horses up to the third floor, and “where’s the poly?” I told Sam and Dean to choose from the watch gallery and the fourth floor (too dark); they chose the gallery, and started scraping and sanding after putting down more floor paper. Paint chips rained down and filled two contractor’s bags. I can imagine how beautiful it will be up there when the lovely surrounds on the ceiling windows and the center medallion are repaired and freshly painted. Annie hit her cabinet surrounds, experimenting with different chemicals and techniques and finished stripping them. Coop set out sanding. I hollered and screamed all the way through a clumsy, messy application of Peel Away to two doors. Covered one door, plastic on top, set it up against the wall. Door 2—more hollering—that stuff—I’d forgotten how nasty it is. Coop got an entry door and one half cabinet door sanded and started on the other half-door. It was so gutted that it took awhile to get it done. Then he dabbled in Peel Away for while, if only to shut me up, and I finished the sanding. What a team! With one or two raindrops plunking down on the promenade, we broke for lunch on the Bayonne-facing side of the plinth and watched a storm over Jersey City. Kev saw a single bolt of lightning cut the sky, but it all died down. We’ve yet to get a thunderstorm while out at the Reef. During most of last spring’s window week we worked through heavy rain and gathered down in the kitchen for lunch, companionship, and warmth. Once when Coop and I were out the wind was whistling in a strange way we’d never heard before—a hollow whistle from the upper galleries we could hear down in the kitchen. But we have never been out in a thunderstorm, and most of us would love to be. After two hours we took off the Peel Away off, and scraped and washed the doors. I whipped up some Citrisize (don’t criticize, Citrisize), sprayed it on, let it sit for 30 minutes while getting the sharp end of scrapers into the grooves on the panel doors. Washed off the Citrisize, washed the doors andleft one flat on the saw horses and the other leaning against the wall. They look good. Everyone cleaned up with shop vac and brooms—Sam and Dean on the fourth floor and watch gallery, Annie down below, Coop and I in the workroom where it was sandy and had globs of dried Peel Away on the floor. Stretched out on the sitting room floor, with gleaming doors surrounding him, Kev managed to finish the second coat on all the doors. They look great but he said they’ll need two more coats; the wood is eating up the poly greedily. We’ll be back. Last summer and fall were productive at Robbins Reef. With the help of the folks at Miller’s Launch and the skill of their great captains diving through wakes, we went out often. We restorated eight casement windows that had been shrouded in plywood and steel since the Coast Guard automated the light in 1966. The round rooms on the first three levels and the landings in the stairwell are full of light. It is astonishing. With funds from the New York Landmarks Conservancy, coupled with matching funds from the museum’s art auction and the extraordinary help of the Noble Crew under the supervision of craftsman Roger Sherry, we ground down and painted the exterior casements, removed the paint from the interior casements, and removed the windows. Sherry then brought them to his studio in Virginia to restore them. As expected, the window frames and the old-growth heart-pine interior casements and sills had withstood salt air since 1883. Most of the glass is intact, and some panes have a faint pattern of light-blue pitting. The copper slides, the tracks the windows travel up and down in, and original pins that hold the windows open that we carefully retrieved are testaments to 19th century craftsmen. The light that fills the kitchen, sitting room, and Kate’s bedroom is amplified by the walls and ceilings, which we scraped and painted white. Kate said she had to keep the place “bright with paint,” and we will too. We also removed the interior doors and stripped them. (Try doing that in a place with no running water). Under the many layers of paint dating back to Kate’s time we found heart pine and oak. We are so grateful to Crew members Gerry Barton, Andrew Blancero, Cooper, Laura Kennedy, Greg Orlando, Peter Patron, Barbara Pezzengrilli, Tim Pouch, Annie Rech, Nan Smith, Chris Steffins, Damon Urban, and Lisa and Peter Yuschak—and to our trustees Brian De Forest, Kevin Mahoney, Eileen Montanez, and Sam Turvey. They endured some mighty dirty weather! The day began at sunrise, a beau jour. I stopped at Dembner’s Hardware, got another caulking gun even though I suspected there was one out there, and the wrong kind of “silicone.” When I got to Miller’s, Kevin and Peter were relaxing in Kev’s van while looking out over the waterfront and discussing birds and boats. Scott and his helpers from Staten Island MakerSpace, Emily and Dustin, arrived and unloaded. Kevin and Peter ambled over, Peter looking spry on his new hip. It was 8:45. I called André; he was on his way. And enough. André mixed it up and set out cementing the base of the lighthouse, Kevin preceding him, chipping and sweeping out bits of stone. They did the entire circumference. Meanwhile Scott and Dustin attacked the door with Peter. They pried off the rusty sheet metal cover and let the light of day into the cellar for the first time since 1966. They had to fit the door onto the original opening and see what needed to be drilled away around the sides. They had to slip the top piece of the door underneath the rim of the lighthouse. All hands, crowbars, and superhuman strength were called on and prevailed. It fit. They could make it work. At a loss as to what to do, I started sweeping in the basement; it was a great vantage from which to observe the door installation. Each time they moved the new door away from the opening or opened up its doors was a good time to go down, and Kev and Emily joined me to sweep out the pieces of fine, sandy, smelly brown dirt. Scott, Peter, and Dustin got the cement sides drilled away, marked and set the places for the bolts, drilled them, and miraculously set the door in place. André descended and cemented upward, filling in cracks with a slap of his trowel, expertly, intensely. It would hold, he said, and the others agreed, until we can get back and do more. Tools and garbage down on the platform, the last of the cement water carefully poured in crevices on the caisson, we ascended. Everyone had had a moment up on what we’ve come to call the balcony deck, but this was our time together. We settled our backs against the white wall on the wind-swept white deck, broke bread together, and talked about the Bay, like a lake below us. Caption: Looking down as we install the new cellar door, fabricated for us by Caddell Dry Dock and Repair Company.